In order to unlock the full-featured version of Hidden Start, you must have a serial number provided by NTWind Software. The serial number can be purchased online at this website, go to the order page for more information. 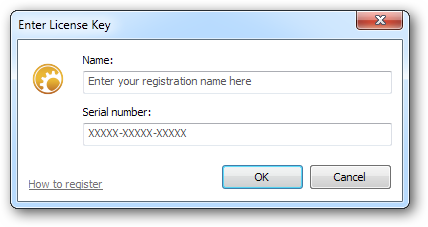 Once you have a serial number, you can proceed to the software registration. Follow the steps below to register your copy of Hidden Start. Enter your registration name and serial number in this dialog and click OK.
Hidden Start prompts for administrative privileges to save the licensing information for all users in the system. 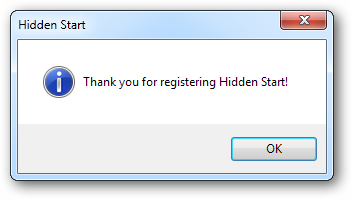 If you click Cancel in the UAC confirmation dialog, Hidden Start will be registered for the current user only. 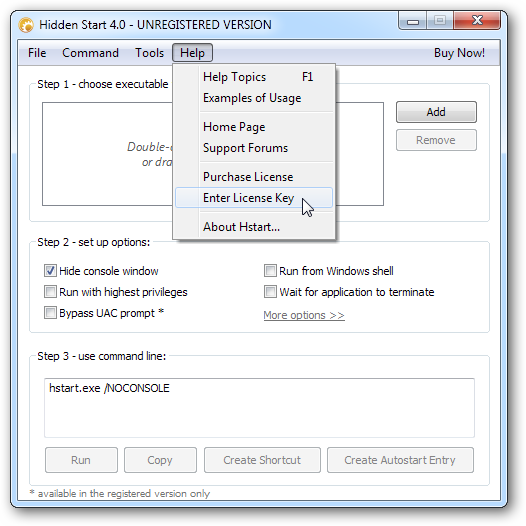 Now you can start working with a fully functional version of Hidden Start. If you have lost your product key, contact us. Remember to provide some information about you and your purchase (order#, email, name, company, approx. date, etc). We will gladly re-send you the licensing information at no charge.